HomeNewsLast-Minute Save For Toronto Lanc? The Canadian Warplane Heritage Museum has stepped in to try to keep an historic aircraft in Ontario. 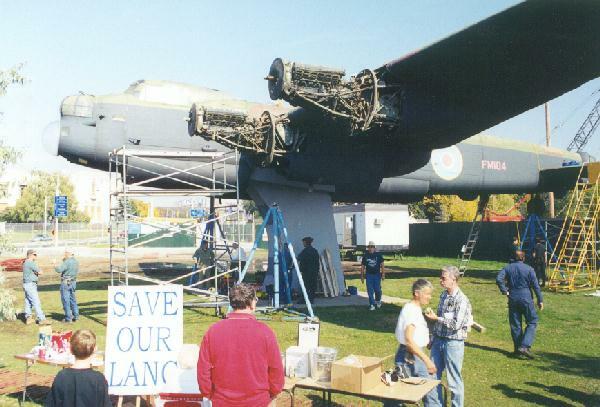 For decades, a retired Lancaster bomber stood on a pedestal near Ontario Place but it was removed and put in storage. A volunteer effort was launched to restore the aircraft but it hasn’t been able to raise the money necessary. Local officials are tired of paying the storage bills so they were ready to give the aircraft, one of about 400 built at nearby Malton, to a B.C. Aviation Museum. Toronto City Council votes Monday on whether to sign that deal but CWH is asking it to hold off. CWH President David Rohrer said the aircraft is an important link to the massive aerospace effort that boomed in Ontario during the war and afterward. He said the aircraft should stay in the area and his museum has a plan. It would restore the plane to taxiing condition as a complement to the flying example it maintains at its headquarters in Hamilton.